Setting up an email on Shopify is only possible if you have purchased a domain on Shopify. 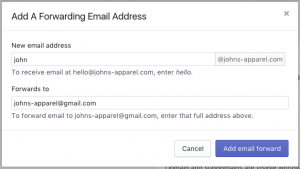 It only allows email forwarding in this scenario too, as Shopify does not offer any email hosting service. However, you can forward unlimited email addresses for free with your Shopify store. to set up multiple forwards to different email addresses too. Enter the full email address where you want to forward emails to, in the “Forwards to” text field section. Click “Add email forward” button to complete the email forwarding process. It is good to do a Test email to check and confirm the email forwarding is working properly. Also, it is recommended to send an email reply with your domain. In the Shopify’s domain case, you need to set up another email in your email service provider. If you have a Gmail account, Click here to set up an another email address. Once successfully done, you can reply your customers with your Shopify store domain.